LoveIsLove waits to tangle with LGBT bashers in a fun way. You get some interesting places designated as PokeStops and Gyms. Such is the case with 3701 SW 12th Street in Topeka, Kansas, which has been designated a gym by the popular Pokemon Go. When it isn't a gym, it is the home of the Westboro Baptist Church. So what are people to do to combat the hate that usually spews forth from the bowels of the organization? Have a little fun. 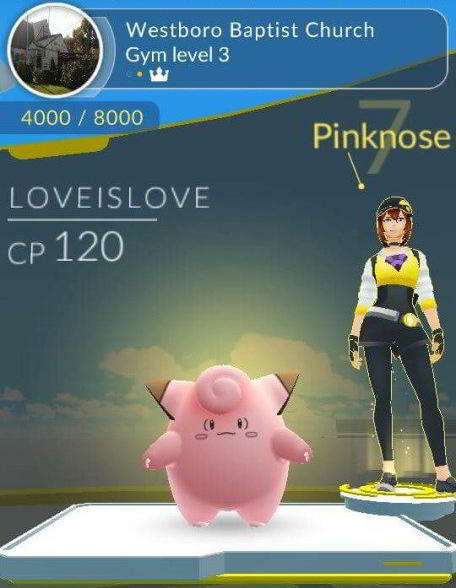 A Pokemon Go player named Pinknose has decided to startion a Clefairy named LoveisLove at the gym, obviously a needle in the side of the WBC group that has taken on the LGBT community, and any other group that doesn;t fit within its ultra-conservative views. Once WBC got wind of it, they quickly recruited Jigglypuff to urge followers to "Pokemon Go and sin no more." "We try to speak whatever language is being spoken," Steve Drain, an elder at the church, told USA Today. ""This little church, as despised and vilified as we are, the location of this church will be memorialized throughout eternity." It isn't clear if Jigglypuff and Clefairy have squared off yet for dominion over the gym. You would think WBC could have come up with a better champion, given that Jigglypuff is also a fairy (albeit normal). Maybe Haunter, or Koffing? wow even Jesus is playing this thing? They like twisting pop culture to fit their ideology. IIRC there was a scene in a documentary where they changed the lyrics to a Britney Spears song during a workout session.